Nothing beats the feeling of soft, spongey grass under your feet in your own backyard. Not only is grass the perfect choice for your backyard, but it has a powerhouse of environmental benefits too. A turfed backyard can help reduce air-conditioning costs by naturally cooling our homes, and provide a fantastic space for kids to play and adults to relax. Similar to trees, lawns remove carbon dioxide from the air and create massive quantities of fresh, clean oxygen for us to breathe. Because of the expanse of our lawns, grass can have a phenomenal effect – removing more carbon from our polluted city air than all our trees and shrubs combined! That’s why maintaining your perfect, lush lawns is one of the greatest environmental actions we can take to reducing our household carbon footprint. Our soils, lawns and gardens play are a vital component of our inner-city eco-system. Without them, so many wonderful aspects of our natural landscapes would disappear. The environments that surround our metropolitan hubs are increasing growing to include more trees, plants, shrubs, flowers, lawns, lakes, creeks, parks and ovals. These eco-systems will in turn thrive, attracting natural wildlife like birds and insect. Lawns feed our entire eco-system more than anything else around us. Our lawns are vital for our very survival within cities and suburban areas. 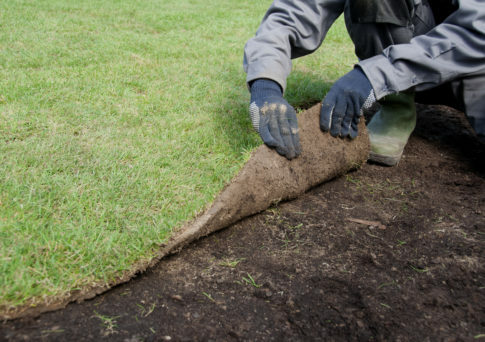 That is why choosing turf and maintaining it, is very important to us at Go Turf. With such a wide variety of turfs to choose from how do you know which one is best suited for your situation? When you are ready to have the perfect backyard, look no further than our high-quality fertilising product range. We offer a wide variety of turf and fertiliser products to keep your gardens look beautiful and green (and inhabitable too). Don’t hesitate to contact our team with any of your lawn care questions. You can also explore our range of Turf Tips online or through our Facebook page.